With the threat of snow here in the Northeast region, I thought I’d share my current (and one of my favorite) morning recipes. I drink this almost every morning during the winter and it satisfies my desire for warmth, soothing, and chocolate! In addition, it’s incredibly healing to the gut and supplies a good dose of protein and healthy fats. It's a complete meal right in my mug! What makes it so healing? Hydrolyzed beef protein is like bone broth with a nice vanilla twist. This helps plug in the “holes” that might be causing leaky gut. The collagen powder also helps to heal the gut, lubricate the joints and encourages nice skin, hair and nails. Coconut oil adds healthy fats that protect the brain, arteries and vessels and amps up your metabolism (so you burn more fat). Pure cocoa adds flavor, magnesium, and other minerals without adding in sugar. It’s pure deliciousness and I feel great knowing I’m giving my body the nutrients it needs to repair and heal. In a 4 cup measuring cup (or enclosed blender such as NutriBullet), heat coconut milk and coconut oil for 1-2 minutes. Add powders and blend with an emersion blender. Add 1 cup of boiling water. 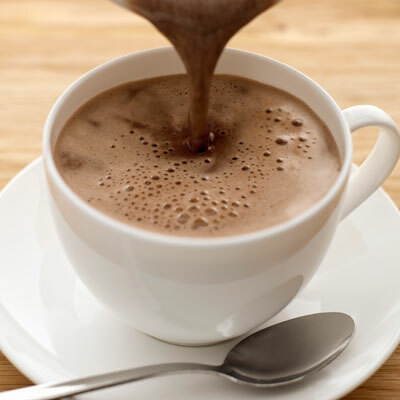 *For mocha, substitute boiling water for brewed coffee.